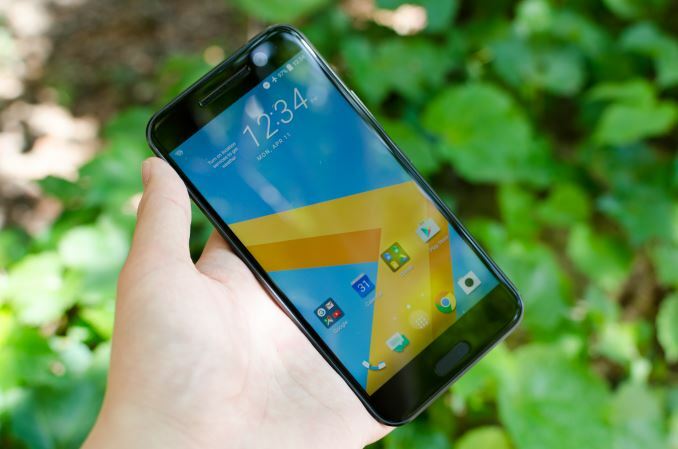 While I’m still working on the full review for the HTC 10, there’s obviously a lot of questions flying around for at least a few of the claims that HTC is making. While I’m still not quite sure how I feel about the audio and camera on the HTC 10, I can at least start to talk about battery life. While the HTC 10 uses the same Snapdragon 820 SOC we've already seen a couple of other places - and as a result application performance doesn't deviate much from those other phones - the same cannot be said for battery life, as the choice of displays and firmware optimizations play a major role here. 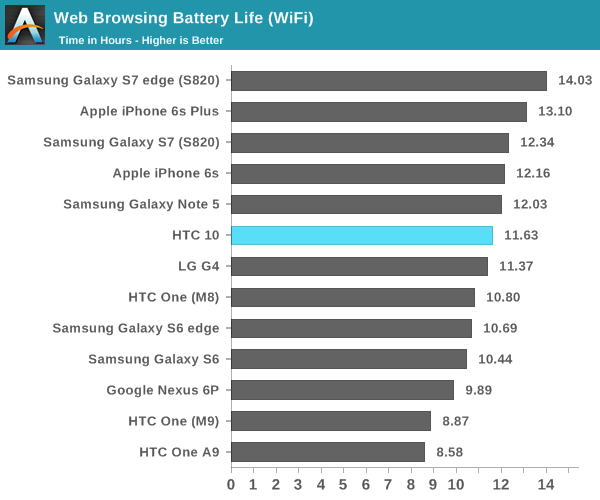 As mentioned in part 1 of the Galaxy S7 review, our new web browsing battery life test attempts to have much more realistic workloads. In addition to updating the test pages to modern websites, we’ve added a component of scrolling through webpages which will help with making a more realistic and reasonable test. While we don’t have a touchscreen CPU boost interrupt firing upon scrolling, scrolling introduces a workload that can test how well the governor can select a proper CPU frequency to complete a fixed amount of work over a given amount of time rather than simply detecting a high CPU load and sending the CPU into a maximum performance state. The scrolling component also means that we no longer give PSR more credit than it realistically should have, and provides some kind of stress upon the display pipeline that we previously left unexplored. In WiFi, we can pretty clearly see that the HTC 10 actually has a notable lead over the Galaxy S7 with Snapdragon 820, although the difference isn’t necessarily enormous. I’m actually pretty surprised by this showing from the HTC 10 because our test is specifically designed to decrease the average APL with a few pages that have dark themes. Another factor that tilts the scales against the HTC 10 when comparing against phones like the Galaxy S7 is that the Galaxy S7 has an undefeatable power save mode which drops brightness by more than half and throttles the CPU noticeably, while the HTC 10 was run with all power save options disabled. On the LTE side, we see the same sort of pattern continue. Qualcomm’s modem prowress is showing here on the S820 devices, as they’ve managed to get WiFi and LTE power drain to be effectively equal in situations where the power amplifier on the transmit side isn’t trying to pull a watt or so to keep a connection to an eNodeB. Interestingly enough, one thing that our old web browsing test didn’t catch was that LTE modem efficiency on the Galaxy S6 is pretty disappointing. Our new test simulates the effects of ads on webpage loads, so I suspect that the Verizon Galaxy S6’s modem is not very efficient at idle, while the sort of race to sleep workload that we saw in the old web browsing test wouldn’t show these issues. In the interest of having a comparison that is basically almost all static display at this point, I also ran our last generation web browsing test. As another data point it’s pretty interesting because this actually suggests that Samsung AMOLED is more efficient than HTC’s LCD, which is probably a function of the much higher subpixel density as HTC is using RGB stripe instead of PenTile. Given that the HTC 10’s Tianma display definitely doesn’t use photoalignment to achieve higher contrast ratios and its relatively low maximum brightness compared to the Galaxy S7, this result is really more in line with what I was expecting. I’m honestly curious as to what optimizations HTC is doing here to pull off better power efficiency here in our 2016 web browsing test, because the SoC bin in the HTC 10 review unit is noticeably worse than the Galaxy S7 and Galaxy S7 edge that I received. It's unlikely that this will be the case on average when comparing devices as a whole, but for our review it will affect relative results. On top of this, the display doesn’t seem to be particularly efficient compared to the Galaxy S7’s AMOLED display as seen in the test results above. 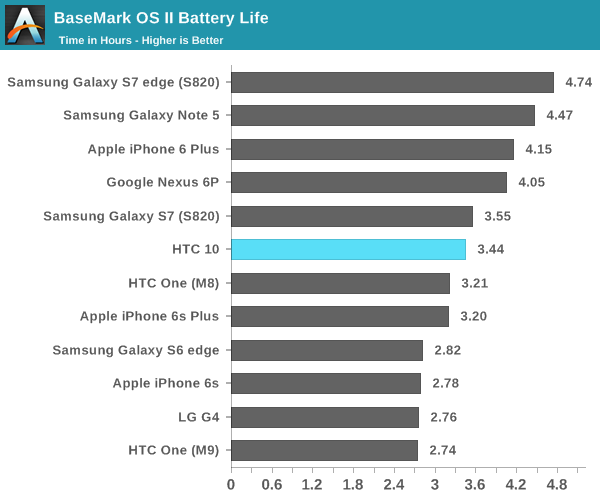 In the interest of discussing throttling performance and to get an idea for what the lower bound of battery life is like on the HTC 10, I also went ahead and put it through our Basemark OS II and GFXBench battery life test. 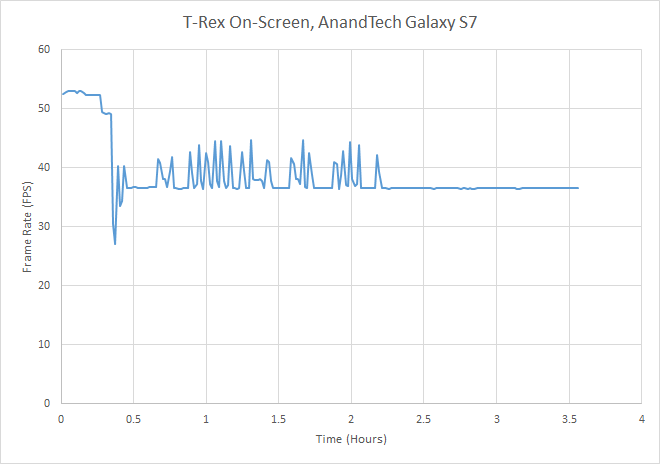 While we’re actively transitioning to GFXBench 4 and also moving to a newer Manhattan 3.1 battery life test, for 1440p Snapdragon 820 devices our traditional T-Rex rundown is sufficient to show throttling behavior and give an idea of what the lower bound for performance looks like. 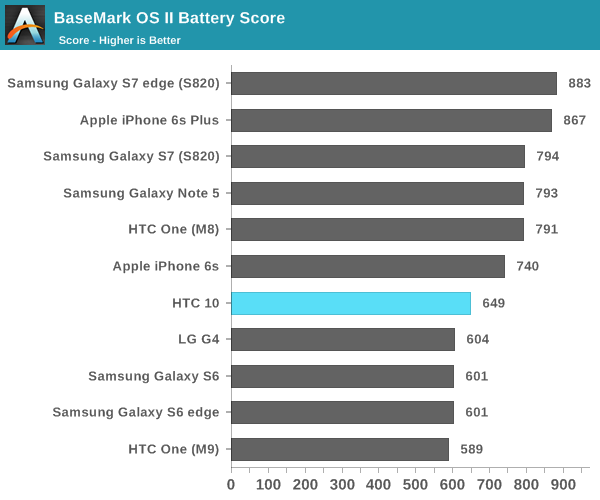 Starting with Basemark OS II, we’re really seeing the effects that a worse bin has on the HTC 10 as the device noticeably trails the Galaxy S7 here, but overall runtime is pretty similar as the difference in display efficiency is going to be minimized. We’re also seeing a difference in the kind of load that the two devices can sustain, as the HTC 10’s aluminum unibody means the maximum allowed skin temperature is going to be lower than what the glass-backed Galaxy S7 will allow. Whatever the case, the Galaxy S7 is ahead here. 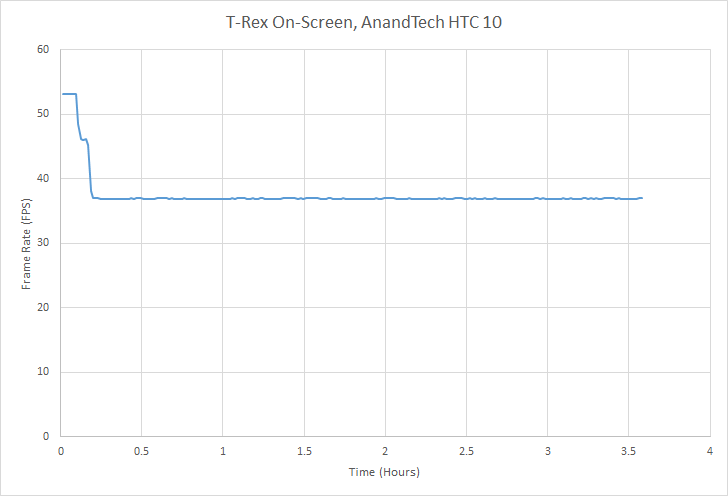 In GFXBench again we can see a similar sort of pattern in which the HTC 10 lasts about as long as the Galaxy S7, but in general it tends to throttle faster. However, it’s possible to see how the Galaxy S7’s throttling is best described as oddly configured as Samsung seems to prefer some oscillating behavior which negatively affects power efficiency before settling into steady state in the long run. It’s probably not a surprise that both have the same steady state as the back cover of the HTC 10 distributes heat quite evenly and both are roughly the same size. 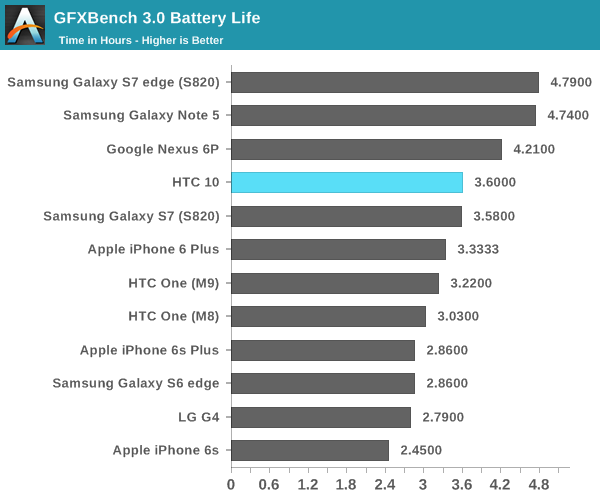 At any rate, the HTC 10 ends up being quite similar if you’re only comparing runtime and steady state frame rate, although the Galaxy S7 does manage to sustain more time before throttling down. Whatever the case, overall battery life between the Galaxy S7 and HTC 10 are going to be similar, although how similar is going to be workload dependent and the bin of the SoC you end up getting. If your workload is almost purely display-bound, the Galaxy S7 seems to come out on top. 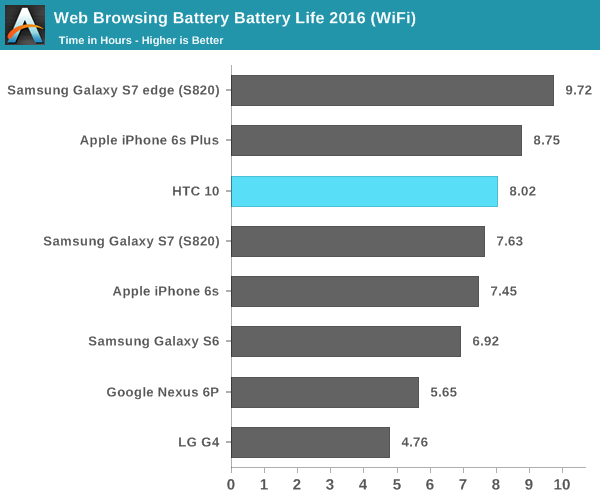 If your usage is more mixed and primarily stresses the CPU like our 2016 web browsing test, the HTC 10 will edge out the Galaxy S7 and iPhone 6s by a nose. If you intend on running power viruses on your phone, it's likely that the bin of your SoC will matter more than anything else but runtime on both devices will be similar. 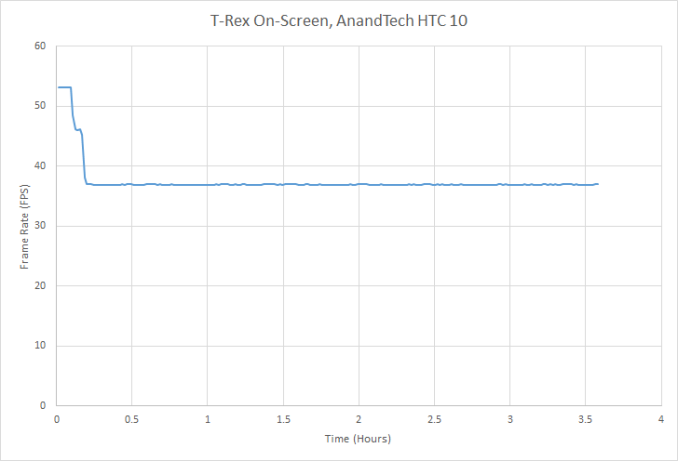 Of course, due to the aluminum unibody limiting maximum skin temperatures the HTC 10 will probably start to throttle sooner but steady state performance should be similar. If you want a clear upgrade in battery life, basically the only choice at this time seems to be to go to a larger device like the Galaxy S7 edge. 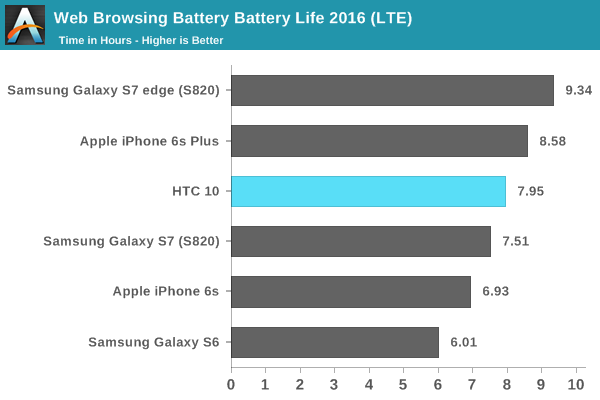 Outside of battery life, one inevitable question is whether the HTC 10's eMMC is a detriment to the device. While this is by no means an exhaustive examination of storage performance, we can look at AndroBench 4 to get a good idea for performance. Unfortunately with Android 6 AndroBench 3.6 has broken timers yet again leading to wildly inaccurate figures for performance, and AndroBench 4 varies significantly from run to run for random read and write so for now we really can only disclose sequential figures with any level of confidence that these are comparable to AndroBench 3.6 and StorageBench performance figures. 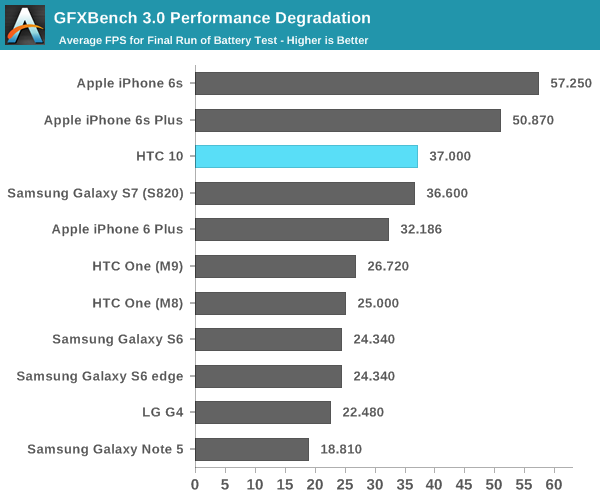 If you were fully expecting the HTC 10 to perform worse than the Samsung Galaxy S7 here like I was, you'll probably be surprised to learn that it doesn't actually do worse all the time. 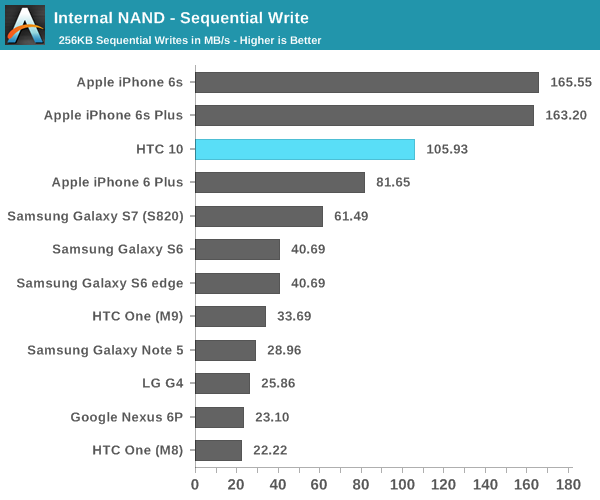 In this test at least, write performance of the HTC 10 is 75% greater than the Samsung MLC UFS solution in the Galaxy S7 due to the use of an SLC write cache. However, sequential reads on the Galaxy S7 are about 35% higher than what they are on the HTC 10. The same sort of pattern repeats itself in the random read and write tests for AndroBench 4, so at a high level it's pretty fair to say that things like burst camera photos, app updates, and similar write-intensive operations are going to be faster on the HTC 10, while read-intensive operations like loading apps may be slightly faster on the Galaxy S7 if storage reads are the critical path. Overall, it's clear to me that the HTC 10 could be a contender for high end Android smartphones. If you were just to go down the spec sheet, it's probably fairly easy to conclude that HTC can't really go toe to toe with Samsung. However, with our tests so far there is a surprising amount of nuance to all of these comparisons that has to be considered. Battery life seems to be worse than the Galaxy S7 if you just consider display or SoC efficiency, but in a mixed use scenario HTC manages to close the gap. 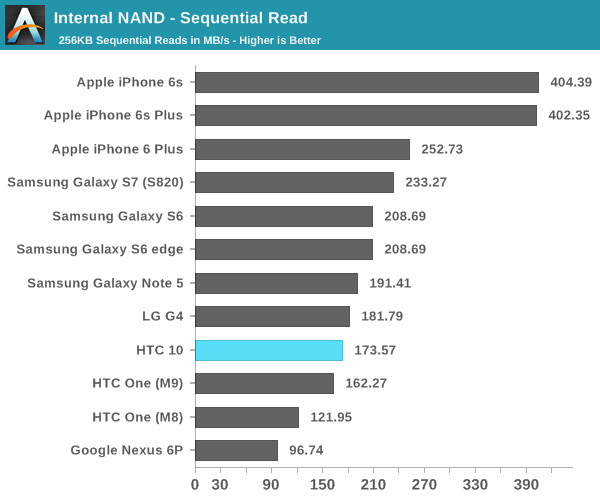 NAND performance seems to inevitably trail the Galaxy S7, but with the right eMMC selection HTC has a significant lead in write performance in all scenarios. In my experience, this seems to be the overall story of the HTC 10 thus far, although there are cases where one device is clearly superior to the other. Of course, this will have to wait for the full review, which should be in the near future. Honestly that sounds like an amazing test. Some people browse the web all day, some just text, some abuse their phone like it owes them money. This has lead to many people saying their phone gets 9 hours of SOT while another only gets 2 hours. Sure these standardized tests gauge phones all the same but what you described is the most demanding situation a phone can be in and I think its a true testament to a phones battery life. Truly a sucker is born every minute. Let me just tell everyone out there, who is not a physicist, from someone who IS a physicist, that this is one-hundred percent grade-A scam.